Why Does Gutter Pitch Matter? Are the gutters on your home pitched properly? No, we’re not asking how well they sing, but instead if they’re angled at the correct pitch to ensure proper drainage. As long as the gutters are still hanging on your home and collecting water when it rains, you probably think that they are doing their job. But the truth is that the pitch or slope of your gutters might be off ever so slightly, and as a result, you could be at an increased risk for strained gutter connections, standing water problems or other concerns – and you might not even realize it! It’s why having your gutter pitch checked every so often is a good idea. 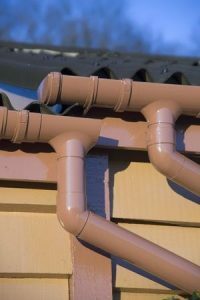 The pitch of your gutters refers to the downward slant that they take in the direction of the downspout that dictates how quickly water flows through them. If they aren’t sloped enough in a downward direction, rainwater will often pool inside of your gutters and stay there until there’s enough water in them to allow it to start spilling over the sides. But if they’re sloped too much, it will cause rainwater to rush through your gutter system too quickly. Since the rainwater can’t accumulate properly if the slope is too steep, water can splash over the edge and lead to water spilling along your home’s exterior or down the foundation. In both of these situations, the water running off the sides of the gutters instead of down through your downspouts means that you will often find water pooling near your home. This water can eventually cause damage to your foundation or work down into your basement, causing flooding and water damage. Even in a best-case scenario, you’re likely to have stagnant water sitting in your yard that could be a breeding ground for insects or damage your landscaping. The good news is that you can prevent all of these problems simply by having your gutter pitch inspected. Roofing by Bruce can take a look at your gutters, check the pitch, and tell you whether or not you could benefit from having your gutters repaired, replaced or simply repitched. You might not be thrilled by the idea of spending money on your gutters when they look fine to the naked eye, but you could end up saving yourself quite a bit of money by checking your gutter system and making sure that everything is working as it should. Contact Roofing by Bruce at 570-424-8891 today to schedule an inspection of your gutters.